We hope you enjoy this series of notes from the one and only Captain Carl. He wrote these notes over a few days, as he wrapped up his last voyage onboard the Azamara Quest. 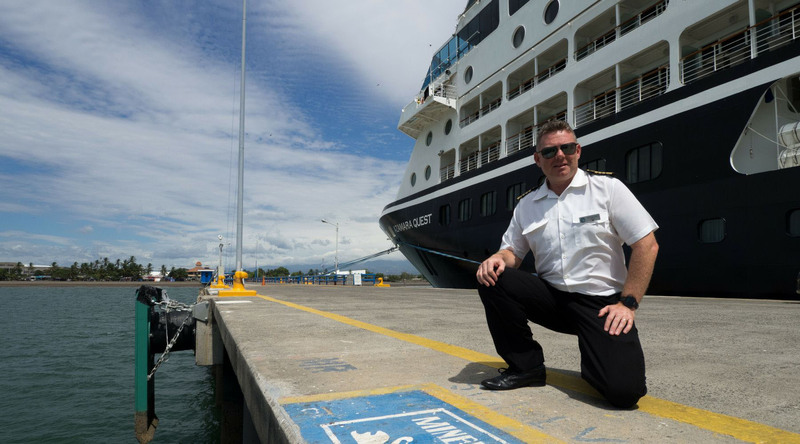 Captain Carl will be the Senior Captain onboard the Azamara Pursuit when the ship sets sail later this year. Is it the end of an era? Or the dawn of a new age? A bit of both, to be honest with you. I can’t begin to describe how much I am looking forward to the challenges that 2018 is bringing to my door. All of them, well, all of them apart from the first one, and, if I may, I will come back to that part later. As most of you will know by now, I have been asked to start up the Azamara Pursuit. This is both a huge honor and a huge responsibility, and one of the many challenges which I am looking forward to. I worked onboard this vessel back in 2003. Actually, I was in charge of starting it back then, when she changed from her original name, the R8, to Minerva II, chartered by Swan Hellenic. That is when I fell in love with R Class ships. I was responsible back then for implementing the ships Emergency Organization, and all of the Safety and Quality systems required by law under the International Safety Management (ISM) Code. Once the ship was up and running, however, I stayed onboard her as Staff Captain and remained there for the next three and a half years. At the time, it was the happiest ship afloat (Azamara did not exist back then) and I loved it. I learned most of my communication skills from consummate professionals, dining with Lords and Ladies on a daily basis, and finding my feet in the hospitality end of the Maritime business. I will join the Adonia on February 23rd in Barbados as a passenger. The ship will exit service on March 9th and head for Grand Bahama Dry Dock where we will take over the management, rename and re-flag her, paint her hull, and I will take Command of the third ship in the Azamara fleet. From there, we will sail to Belfast in Northern Ireland, where the largest refit in our history will take place at the Harland and Wolff shipyard. We expect numerous press events, both on our arrival into Belfast and also as our Maiden Voyage on August 1st approaches and commences. I look forward to this also. There are some new ports for me lined up in 2018. Planning her deployment and itineraries is something that I have been working on for some time and am enjoying immensely. We are recruiting a new crew, which will partially be made up of crew members that we all know and love. Some, unknown to you, will be behind the scenes and have been with Azamara from the beginning. Most, however, will be brand new faces to both you and me alike. Putting a team together to rival the world-class crews of Azamara Journey and Azamara Quest poses certain challenges in itself. To my knowledge, nobody else has managed to do it! I am looking forward to this, too. Now, for the part I am not looking forward to, and indeed, I am not enjoying typing this right now. Things were different nine and a half years ago. I was already on vacation from Azamara Journey when I was asked if I knew anything about the Suez Canal, the Gulf of Aden, India, the Singapore Straights, Vietnam, Thailand, China, and Japan. When I answered yes, to all of the above, I was offered the Azamara Quest and accepted without all the complications of saying “goodbye” to the Journey and her crew. Things are different now, I am well into my “last” cruise onboard Azamara Quest. I have made my “last” Captain's Welcome. My “last” Le Club Voyage party. My “last” crew drill. My “last” hosted dinner. My “last” Indian Curry night! I have packed. Well, almost. Nine and a half years of acquired bits and bobs. My kids' scooters. My wife’s shoes. Uniform. Photos. Memories. It’s like moving homes. It’s emotional. Phew. Very emotional. Last night I had my “last” White Night Party and Crew Waves onboard the Azamara Quest. It was one of the most difficult things I have ever done in public and I have been dreading it for months now. How do you say goodbye to so many people who have formed such a huge part of your life? I almost choked and at one stage was actually at a loss for words. Me! Not my best speech, but it was genuine. I managed to hold my self together, got through it, and felt an immediate relief of tension. Then, Russ told me not to go anywhere. Out came a truly incredible cake with a scale model of the Quest on it. The Chefs team had been building it in “Dry Dock” in the Pastry Galley for what must have been ages! I have never seen the like before. Next, Russ introduced Amanda Poulson onto the stage, and she sang “For Good”, from the musical Wicked, with a background picture montage of all the things I have been up to over the past ten years. Amanda has performed onboard Quest for four full contracts now and is leaving herself in a few weeks, and she was amazing. The photos documented my own Quest through the past ten years, shared moments with many of our crew, and experiences with my family. There were not many dry eyes in the house at the end. I’m not enjoying this bit at all.